For all my U.S.-based friends, Thanksgiving is almost here!! For everyone else, let the season of eating carbalicious comfort food continue! And there is nothing more American than stuffing yourself on Thanksgiving until you slip into a food coma. With the average Thanksgiving table lined with dozens of heavy, rich foods, this should come as no surprise. And while I am a fan of veganizing traditional comfort foods and don’t shy away from using vegan butter, sugar, and flour in some of my recipes, I do believe in balance. That’s why I created this Vegan Wild Rice Stuffed Squash for Thanksgiving this year. While it’s delicious and comforting, it’s free of refined grains and light enough that it won’t weigh you down. That means you can easily save room for dessert without having to go fetch your stretchy pants. This stuffed squash recipe is hearty enough to serve as a main course, but it also works beautifully as a a side dish, and it’s flavorful and satisfying enough that it’ll win over both vegans and non-vegans. First, let’s talk about the squash. I used both butternut squash and acorn squash because I slightly prefer the taste of butternut squash, but like the deeper cavity of the acorn squash. However, if you aren’t as picky as me, you can use just one of the two. The hardest part of the squash is slicing it through (if you’re using butternut squash). If your butternut squash seems too tough to slice through, just give it a quick heat in the microwave for 2 minutes to make chopping easier. Then you’ll scoop out the seeds and drizzle the squash with olive oil and generously salt and pepper it and roast until tender and lightly browned. You don’t want to over-roast the squash until it’s so tender that it’s falling apart - while it will taste delicious, it will be too soft to hold up the filling. For the filling, the main ingredient is wild rice, which you can easily cook on the stove or in your Instant Pot or other pressure cooker while the squash is roasting. I use wild rice because I like how robust and hearty it is in comparison to white rice and even brown rice, making this dish a suitable option for a vegan main course. However, wild rice, on its own, has a fairly distinct taste and needs a helping hand from other flavors to tone down its earthiness. To add some flavor harmony, I rely on aromatic garlic and shallots, fresh herbs, a citrus dressing, tart dried cranberries, buttery pine nuts, and sweet pomegranate seeds. Once you’ve popped the squash in the oven and started cooking the wild rice, use the remaining free time to prep the wild rice salad ingredients: sauté the shallots and garlic, chop the kale and herbs, toast the pine nuts, and make the citrus dressing. When the rice is done cooking, simple drain off any remaining water and mix with the rest of the ingredients. Scoop the wild rice salad into the squash cavities and serve warm. I like to add a drizzle of good-quality tahini right before serving because, well, tahini makes everything taste better. 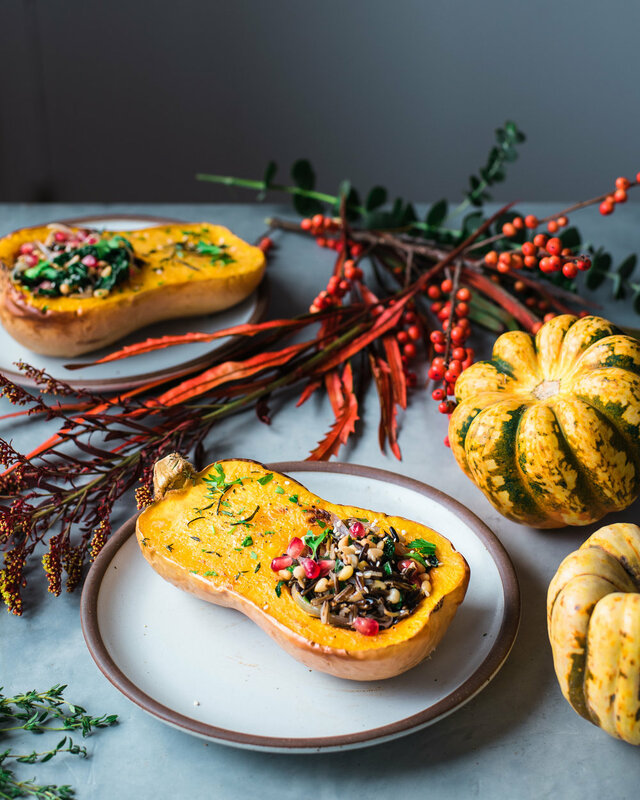 I hope you try out this easy, delicious, and healthy Vegan Wild Rice Stuffed Squash this holiday! Preheat the oven to 425°F (or 218°C). Roast the squash: Slice each butternut squash or acorn squash in half and scoop out the seeds with a spoon. Place each squash half, cut side up, on a baking sheet and rub each with a bit of olive oil, kosher salt, and pepper. Roast acorn squash halves for 45 minutes and butternut squash halves for 50-55 minutes or until the flesh is fork tender and lightly browned. Rinse the wild rice well. Wild Rice, Instant Pot Method:Add the wild rice and 1 1/2 cups vegetable broth to the inner pot of the Instant Pot. Secure the lid and select the Pressure Cook/Manual setting for 25 minutes. Allow a natural pressure release and drain off any remaining liquid. Wild Rice, Stovetop Method: Place the wild rice and 3 cups of vegetable broth in a saucepan over medium-high heat. Bring to a boil, then turn the heat down and cover. Simmer for 40-45 minutes, or until the kernels have burst open. Drain off any remaining liquid. Make the wild rice salad: Heat the 1 tablespoon olive oil in a skillet. Once hot, add the shallots and cook until they are starting to soften, about 4 minutes. Add the garlic for 1-2 minutes, stirring frequently, until golden. Add the shredded kale and season to taste with salt and pepper, stirring for 1-2 minutes or until the kale is starting to soften. Turn off the heat and transfer the vegetable mixture to a large bowl. Add the cooked and drained wild rice, along with the pine nuts, chopped parsley, chopped basil, dried cranberries, pomegranate seeds, orange zest, orange juice, and 1 tablespoon extra virgin olive oil. Toss well to combine and incorporate the flavors. Season to taste with salt and pepper. Stuff eat squash cavity with the wild rice salad. Drizzle each half with a bit of tahini.